Notre Dame is fresh off a College Football Playoff appearance and expectations are as high as ever in South Bend. The Irish return many critical pieces including one of nation’s top defensive lines along with quarterback Ian Book. In the Cotton Bowl loss to Clemson, the Tigers skill positions took over the game despite the Irish competing in the trenches. 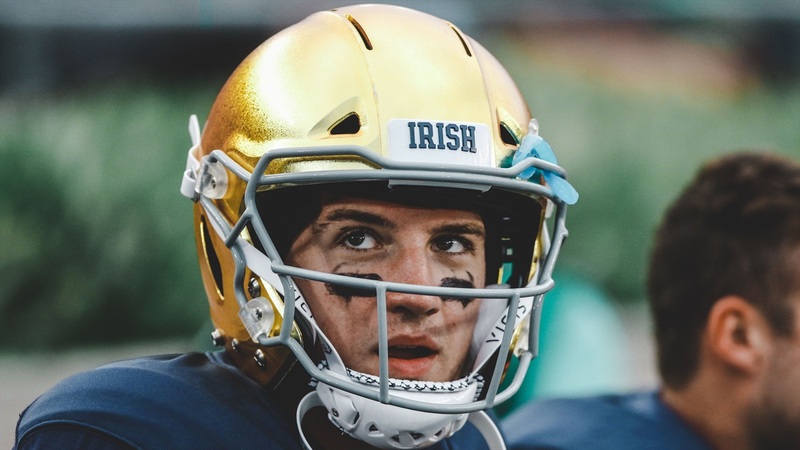 Notre Dame feels they have talent at receiver and senior receiver Chris Finke feels the young receivers have had an impressive start to the spring. Receiver isn’t the only position on offense breaking in some new talent on the depth chart. Quarterback Phil Jurkovec redshirted last fall, but he did get into a few games to gain some valuable experience. However, Jurkovec is now being tossed into the fire each practice and has impressed his teammates with how he’s learned the offense and made plays. “He’s not the starter right now, but it’s his first time heading into being a No. 2 and getting a ton of reps,” said Finke. “He’s taken control of the No. 2 offense to feel it out and getting timing right with the receivers. At tight end, junior tight end Brock Wright isn’t exactly a new face to the offense after playing his first two seasons in a limited role, but the Texas native is ready to become a more significant part of the offense with classmate Cole Kmet. One area of focus of the Irish offense has been getting more yards after the catch as Notre Dame struggled to get loose a year ago. On the defensive side of the ball, Notre Dame has too many options at defensive end. Yes, it was weird to type out, but that’s the case as the Irish boast one of the nation’s top edge units. Redshirt freshman Ovie Oghoufo and early enrollee NaNa Osafo-Mensah have flashed at times this spring, which hasn’t surprised senior Daelin Hayes. Hayes will complete his fourth spring in a few weeks and believes Mike Elston will play the best player regardless of class, so each player has to be ready to contribute when their number is called. Perhaps the most significant move on defense was sophomore Houston Griffith moving from nickel to boundary corner. Griffith arrived at Notre Dame as a safety, but was forced to provide depth at nickel last fall after Shaun Crawford tore his ACL in fall camp. Troy Pride Jr. has been impressed with Griffith’s quick adjustment to the position, but the writing has been on the wall for those who see Griffith on a daily basis. “Houston was an All-American in high school,” Pride said. “He already had the tools and patience. He’s very good with his hands. He’s a fluid corner and does so many things well. If you look at the weight room board, he’s at the top. Pride and Griffith don’t lack confidence and could form another dynamic cornerback duo at Notre Dame, which would be music to Clark Lea and Irish fans across the country.